In this post, I am going to offer advice for using t shirt yarn and answer some common questions. Let's start with a synopsis of how it is made. Once a suitable t shirt is found, the top of the t shirt and the hem are cut off and set aside. The tops and hems have separate uses. 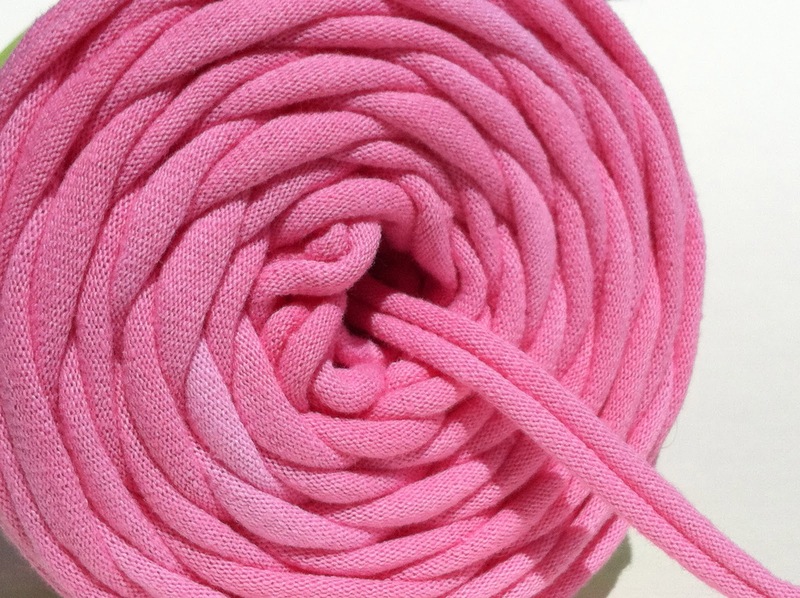 The tops of the shirts are often used to create crafting cords. These are cut into long strips, usually around 20" or so and corded in the same way as tarn. The hems are often used for weaving rugs. I will talk more about these cords and rugs in another article. After taking of the top and the hems, the t -shirt is cut into a long continuous loop and then a cord is created. This is the finished product. Some people will dye the tarn and can create some very stunning color combinations. I do not dye mine, as to not introduce chemicals, but to each their own. I have seen some beautiful tarn that has been dyed. As long as they are not using new t shirts, and if that doesn't bother you, I can still consider it somewhat eco friendly and wouldn't discourage you to look into it. If they are using the dye on new t-shirts it is not eco friendly at all. I'm shaky on the eco friendly aspect of using dye already. But cutting new t shirts, in any way, is just not eco friendly. The weight of tarn is also measured differently. While conventional yarn uses weights like bulky, medium, baby weight and things like that, tarn is measured in WPIs. What are WPIs you ask? Well, WPI stands for Wrap Per Inch, meaning the number of times you will need to wrap it around a pencil or a ruler to reach 1". A tarn that is 4WPI means that you will need to make 4 wraps to get to one inch or that the tarn is 1/4" wide. Most of the tarn you will find will be somewhere between 4 and 8 WPI. 4WPI being a bulkier weight than 8WPI. You will also need a larger guage crochet hook or knitting needle to work with tarn. I love projects that use a larger guage, as they tend to be faster projects. Speaking in terms of crochet hooks, for a 4 or 5 WPI, I would recommend a guage of L (8mm) as the smallest I would use. For 6 to 8 WPI, I would recommend a guage of J (6mm) as the smallest I would use. This is not written in stone and is open to an artists inspiration to try something new. So try other guages and see what kind of texture you can create. Always be adventurous in your art and never be afraid to try something different. You can see in this picture how the two ends curl in and leave a very clean looking cord behind. This is what quality tarn will look like. Care of tarn is super easy. It is just like washing your t shirts! I recommend washing in warm water with like colors on the regular cycle and tumble drying on medium. Depending on the finished product, you may need or want to adjust it to cold water or a delicate cycle. You could tumble dry on a low setting, but it will take a long time and a lot of energy. If you are out to conserve energy, I would recommend drying in the sunshine. It will be stiffer if you do it that way, so depending on the project you may want to use a dryer. 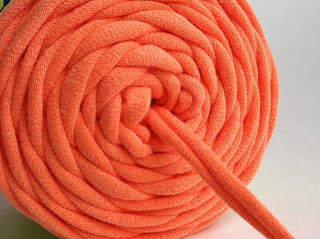 Anyway you do it, t-shirt yarn is very durable and easy to care for. I love things that are easy. Life is already complicated enough, right? Hopefully this will be a good starting point for anyone wanting to use tarn for the first time. You can find several free patterns online and even some tutorials on how to make it yourself, if you would like to give that a go. Mostly, I hope that this will inspire anyone who is afraid of working with a new medium to grab a ball and try it. Believe me, once you make a rug out of this, you will never go back to rug yarn again. This is just as durable and much nicer on your bare feet! If anyone has any questions please feel free to comment below or contact me directly via email. Coming up in May I will be featuring artists who use tarn in their creations. I cannot wait to show you all of the things these talented artists make from this medium! Love this! I am going to cut some old t-shirts and make a rug, potholders, and anything else I can think of! We have lots of old t-shirts and it will be fun to try something new.